We’re seeing more and more prosocial bonuses—bonuses that focus on others as opposed to self—given as a way to connect more deeply with employees. TisBest Philanthropy announces the release of a new video profiling companies that use charity gift cards to recognize employees for length of service. The video features business executives, employees, and charity leaders discussing the benefits of using charity gift cards to recognize and thank employees for their years of service. The growth of formally adopted corporate social responsibility (CSR) goals and objectives in many companies has caused HR staffs to re-evaluate the nature of the gifts given to recognize employees’ years of service. The video features executives and staff of Buildingi, a Bellevue, Wash.-based technology services firm that uses charity gift cards to engage their employees in the firm’s philanthropic giving. Buildingi awards $100 for each year of service for each employee. An employee who has been with the company for 7 years receives a charity gift card worth $700. That money can in turn be directed to any of the 300 nonprofits that are a part of the TisBest list and website. “Length of service is a great way that the longer you stick around, the bigger your footprint is on giving back to the community,” says Don Barnes, Northwest Managing Director for Buildingi. “It takes those resources and puts them in the hands of the people who are Buildingi. It’s a very direct way for them to make a difference,” Buildingi CEO Bill Nolan said. Also featured is IGT, a Reno, Nev.-based gaming equipment manufacturer that allows its employees to choose a charity gift card option as opposed to a more conventional gift catalog. 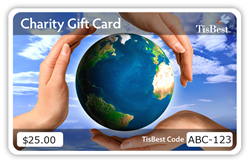 With a TisBest Charity Gift Card, you make the donation and your recipient decides how to spend the donation, choosing from TisBest's 300+ charity partners.TisBest cards are customizable at no additional cost. Learn more at http://www.tisbest.org.